Reliance Precision Ltd.’s longstanding expertise in measurement, inspection and test has been formally recognised by the National Physical Laboratory (NPL). 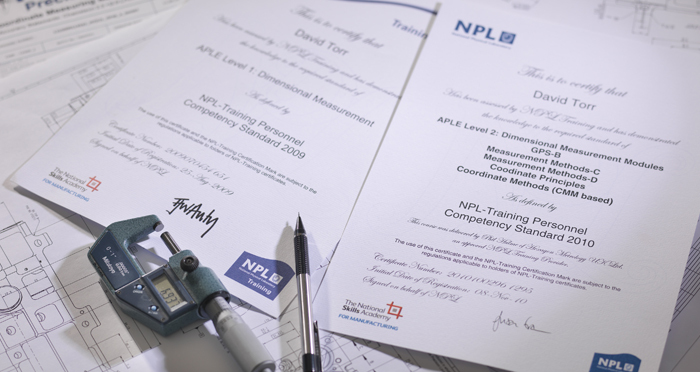 “The NPL’s metrology accreditation is important benchmark for Reliance.” – states Chief Inspector, David Torr – “It means that the metrology skills of our team have been verified by a nationally recognised authority. The NPL scheme assessed our “prior learning experience” and required the team to take a technical examination. We now have a qualification that gives independent proof that we can do what we claim to do”. For Reliance’s customers the NPL Level 1 and 2 accreditations give further confidence in the quality of their supply chain. Reliance provides design, manufacturing and test services to major equipment and systems manufacturers from industries spanning: aerospace, defence, semi-conductor and scientific analysis, and supplies them with custom-built precision components and intricate electro-mechanical assemblies. In all cases accuracy and reliability of performance are critical to the product’s success. A supplier’s metrology skills – its ability to measure effectively – means that during the manufacturing process it can prove that is manufacturing correctly to the customer’s specification. To do this effectively the supplier must be able to demonstrate that they understand what they are measuring, that they can select the correct tools, apply appropriate methods, and that they can interpret the results. “We believe that confident, effective metrology is a prerequisite to reliable supply.” – stresses Manufacturing Manager, Keith Rushworth – “We appreciate that time-to-market and effective performance are critical factors which affect cost, and this has driven us to invest in metrology and test, and to take a very thorough, disciplined approach to manufacturing. It is always reassuring when we receive positive commendations from our customers’ Design Engineers and Quality Managers because this tells us that we are helping them achieve their objectives and that they appreciate the value of working with Reliance. For further information go to www.npl.co.uk.